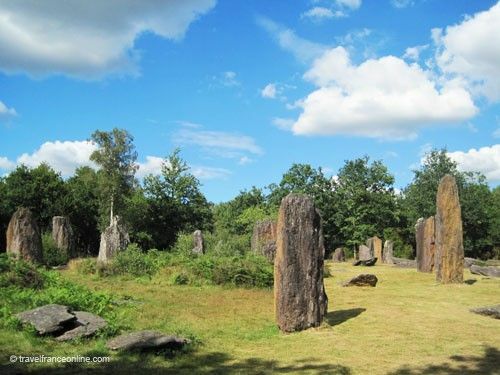 Pierres Droites is the largest megalithic site in Argoat, as Bretons call inland Brittany. 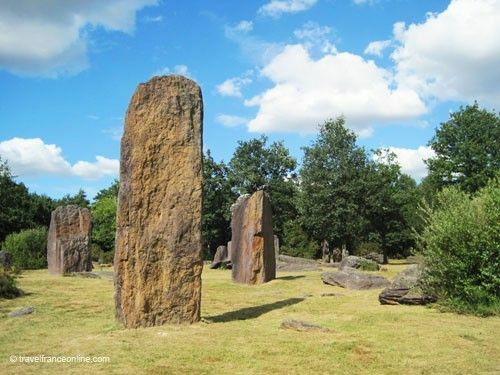 You'll find this exceptional archeological site on the outskirts of Monteneuf, in the south of the Forêt de Brocéliande. This area corresponds also to the Regional Natural Reserve of the Landes of Monteneuf in the department of Morbihan. Les Pierres Droites site was discovered in 1986. Neolithic men erected these forty menhirs or standing stones of purple schist some 6500 years ago. However, the megaliths were pulled down around the 10th century, when the whole of France was finally evangelized. 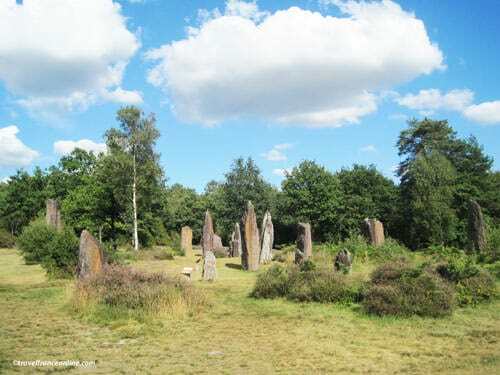 Only three menhirs still stood along the road. Fortunately, the excavations conducted between 1986 and 1996 uncovered that most of the pits and wedging stones were still in their original place. This therefore allowed archeologists to re-erect the menhirs on their location of origin. These stand today in parallel lines among heather moors and conifer groves. The largest megalith, recovered to date, is 5m high and weighs 38 tons. Les Pierres Droites was listed Historical Site in 1997. A small visitor center, L'Archéosite de Monteneuf, welcomes the visitors on the premises and help them discover the site. It also proposes a series of fun interactive workshops that introduce children to archaeology. Finally, access to Les Pierres Droites is free all year long! If you like archaeology, you'll enjoy a hike on the Circuit des Mégalithes des Landes de Monteneuf. This 14km long hiking trail will take you to the discovery of area's other sites. You'll therefore discover a series of covered burial grounds or allées couvertes. Some stand among moors or woods, others in the open countryside. You'll therefore need time, perseverance, dedication to discover the countless archaeological treasures and legendary sites of the Forêt of Brocéliande. You also need to believe in Magic!